It may be over, but we’re not quite ready to let go of our World Cup fever just yet. We look back on the moments that made us want to laugh, scream and take up football. Is your wedding band looking a little pricey? Just wait until the next World Cup, and tie the knot in the presence of Argentinian fans – they’ll happily provide the music for free! In England’s quarterfinal tie against Colombia, the script looked written: They conceded a late goal, miss some good chances in extra time – surely what follows is a penalty shoot-out exit? Not this time. England secured their first ever World Cup win on penalties thanks to some unlikely heroes – namely keeper Jordan Pickford, who made a fine save, and substitute Eric Dier, who slotted home the winning spot-kick. The tension was real. Before Iceland’s opening game with Argentina, 30,000 fans (almost 10 percent of the country’s population) gathered outside Moscow’s Spartak Stadium for a spine-tingling rendition of their trademark Viking salute. No wonder their players came away from the game with a point. The fast-paced opera rendition of Russian folk song ‘kalinka’ at the closing ceremony was quite a spectacle, and it was made complete by the unexpected buck-toothed joy and bongo expertise of footballing legend Ronaldinho. Just look at that face, and tell us you didn’t feel a little happier on the strength of it. Imagine this: You’re in the World Cup Round of 16, and your team has made it to extra time against the star-studded Spainish national team. What would you be thinking? Probably not food, I’m guessing. Much-fancied Group G winners Belgium squared up against Japan in what looked set to be the least mouth-watering tie of the second round. Oh, how wrong we were – it ended up being one hell of a game, with the Japanese setting themselves up for a historic upset after scoring two beautiful goals early in the second half. It wasn’t to be, however; Belgium piled their biggest beanpoles forward and clawed it back to 3-2. What a comeback it was, and a heartbreak for the valiant Japanese. Mbappe, penalty, surely! Di Maria – it’s a screamer! Pavaaaaaaaaaard!!!! Holy god, what a game. Let’s be honest, we all needed a sit down after that mayhem. In spite of Neymar’s antics, Brazil was looking unbeatable before their quarterfinal tie against Belgium. The Red Devils then shocked them with a performance of kings - courtesy of a breathtaking save by Thibaut Courtois and a fine finish by Kevin de Bruyne to round off a magnificent team goal. Belgium’s “golden generation” progressed to the semi-finals and eventually finished third. No, we’re not talking about Robbie Williams. We perhaps saw the tournament’s best match just three games in. Portugal’s exhilarating 3-3 draw with Spain was football at its finest: Long-range goals, silky passing, and an old-fashioned bully of a striker battling it out with perhaps the greatest player ever for the plaudits. Ronaldo’s stunning free-kick was the ending the game deserved, while the match itself got the tournament started in style. One for the ages. If there were a “Class Act Award” for the fans, it’d surely go to the Senegalese and Japanese supporters, who took time to clean their stadium sections after games. Let’s hope this catches on among other fans! France’s N’Golo Kante is often touted as the “nicest man in football.” This was confirmed when, after winning the World Cup as one of the tournament’s best players, Kante had to be given the trophy by teammate Steven N’Zonzi because he didn’t want to impose on his teammates’ photo ops. 5. Taxi for Michy Batshuayi! Celebration of the tournament, hands down. Watch in slow motion for maximum effect. While the goalscorers are getting most of the plaudits, let’s take a moment to look back on some of the legendary goalkeeping we’ve seen this summer. Lloris and Akinfeev were also among the picks of the top saves. Keepers, stand up. Although the timing was questionable, we’re definitely glad he went for it (and then backed out). Someone needs to make a 10-hour version of this ASAP. Did it ever look in doubt? World Cup 2018 – we miss you already. Super Mario 2: Who on Earth is this Brazilian guy playing for the Russian national team? Being an England fan in Russia: What's it really like? 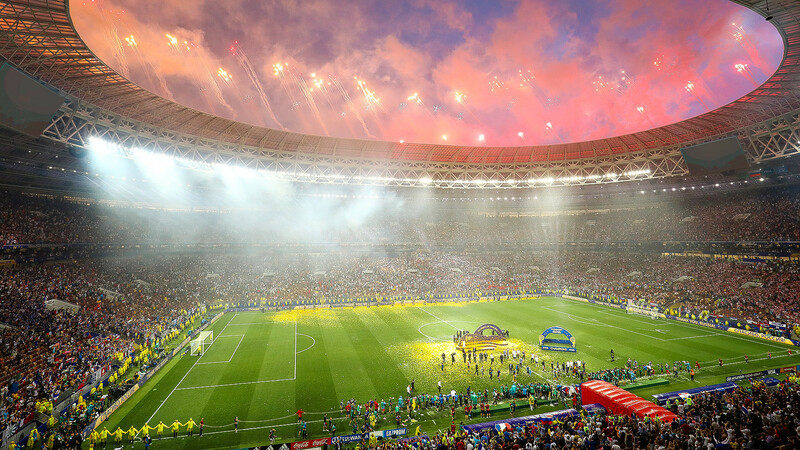 What were 7 offbeat records set at the 2018 FIFA World Cup in Russia?